Reassuring if not entirely unsurprising news, I feel. I am sure that if any location in the United Kingdom could tell us all if I time was coming to an end, it would be the home of time itself, Greenwich. I have been to Greenwich on a number of occasions and at no point has anyone at the Royal Observatory advised me that the end is nigh. But maybe time is up for something that really has overstayed its welcome for a long time now and that is boring, bland and unexciting event catering. This is something that has plagued us for decades and it is about time that everyone who organises catering at events simply chose something else instead. Well, it now seems that people are starting to do just that, as the rise in popularity of the hog roast Greenwich event would suggest. It is no shock that Greenwich should one of the places that would embrace the hog roast as a new and exciting catering alternative, as this is a place with a great royal heritage and a hog roast hire Greenwich is a meal deserving of such regal association. It has not always been this good for the humble hog roast, mind. This is a feast that has endured some reasonably lean times over the years, only being wheeled out now and again for the occasional event, but those served to remind us all that it really is a splendid meal that was long overdue reappraisal. Thankfully, that is what seems to be happening right now, and as any hog roast caterer will tell you, more and more people are choosing to make this fine cooking experience the centrepiece of their social and corporate event catering. So, why is that hog roast events are now so popular? Simple, they’re an amazingly tasty, wholesome, traditional and great value feast that simply knocks aside any of the tired old solutions that we have all been putting g up with for decades. Once you take your first bite of the succulent pork, you will wonder why on Earth you have put up with miserable event catering for so long. Everything about it shouts big flavour, so much so that your guests will know they are in for a treat long before they have even started to eat. You see, hog roast has a big personality, making it perfect for any big get together with family, friends, relations, colleagues or even clients. This is the perfect food to really say ‘I care that you have a great time’. With a hog roast from Taste the Cracklin, you really are guaranteed a great time! You simply have to watch the chef tending to the glorious looking whole pig on the magnificent hog roasting machine to understand how impressive hog roast can be. 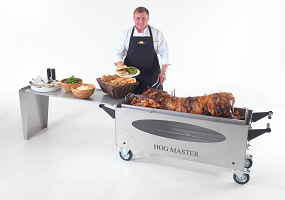 Hog roast looks incredible as it slow roasts away and it is always a magnet for guests. It also makes a very welcome change to be able to see your meal being cooked right before your very eyes. So often at events like these is the food cooked out of sight in kitchens by anonymous members of the catering staff. Functional, yes…but where is that professional, personal touch. Hog roast is everything that special occasion catering should be, and much more. Did you know that a standard sized Greenwich hog roast is more than capable of feeding over one hundred people? That’s right, that is probably everyone on your guest list and a few more, so maybe you can invite those extra people that you initially crossed off! Most importantly of all though is that your guests will adore the incredible flavours of hog roast. For some reason, some people hear the words hog roast and assume that this is going to be something basic and less than special. Nonsense, hog roast is one of the very best catering solutions you can get anywhere. Six hours cooking, a top quality locally sourced pig and a dedicated chef would suggest that in hog roast you have anything but your standard catering solution. Hog roast is a touch of catering class and it can transform your Greenwich special occasion into something quite splendid. Make your event a Taste the Cracklin hog roast event in Greenwich a splendid one.